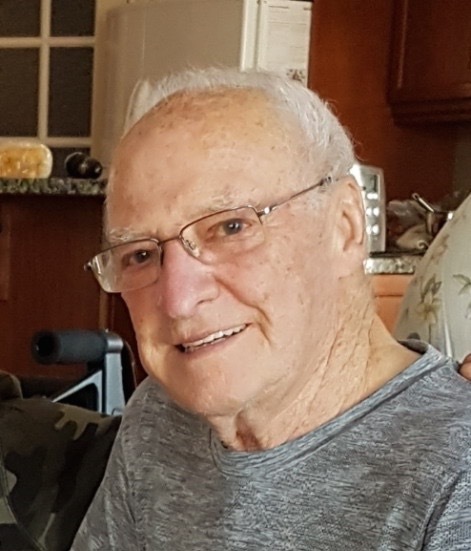 Peacefully on Sunday, October 22, 2017, Andre (Andy) Lussier passed away at Riverview Health Centre, Palliative Care Unit, with his family by his side. Andy will be lovingly remembered by his wife, Rose Marie, and their children, Claudette (Mark), Michael (Aron), Michelle, Nicolle (Réal), Joanne (Peter), Laurie Ann (Donald) and his 14 grandchildren and ten great-grandchildren. Andy is also survived by his brother Albert and sisters-in-law Gemma, Jeannette (Ron), brother-in-law Leo (Leah), as well as numerous nieces, nephews and friends. Andy was predeceased by his parents Mathilda and Hubert Lussier; his daughter Gisele (at birth); his brothers Henri, Louis, Alex, Amadee, Arthur, and sisters Alexandrine, Regina and Henriette. Andy was born in Mariapolis, Manitoba in 1935 and lived on his parents farm until the age of 17 when he and his mother moved to Belmont. Andy farmed for many years in Neelin, Belmont and Baldur before retiring from farming and moving into Winnipeg. Andy was fiercely dedicated to his family and his siblings; he would always be there lending a helping hand and never expected anything in return. Andy and Rose Marie would have celebrated their 35th wedding anniversary on December 11th, 2017. In lieu of flowers, donations may be made to the Riverview Health Centre – Palliative Care Unit. Mass of Christian Burial will be celebrated at 10:30 a.m., Friday, October 27, 2017 at St. Gianna Beretta Molla Roman Catholic Church, 15 Columbia Drive, Winnipeg, with Rev. Fr. Darrin J. G. Gurr presiding. Entombment will follow in Living Waters Columbarium. Reception to follow. for death is the end of my suffering. To wake up with God.